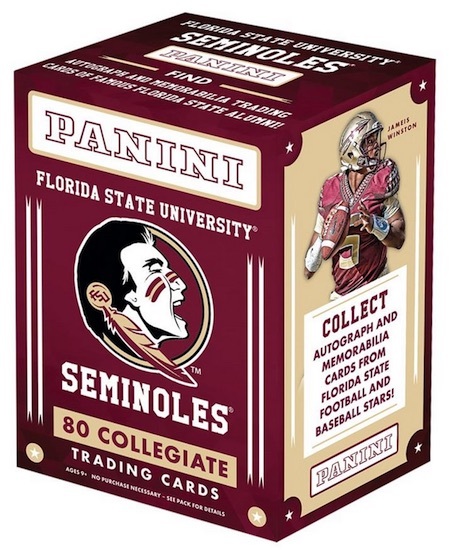 Highlighting the athletics program at Florida State University, the 2015 Panini Florida State Collegiate set includes a variety of sports and seasons in one product. Each box guarantees at least one hit and several parallels. Some of the biggest athletes in FSU's history comprise the 80-card base set. Football is represented by Deion Sanders, Fred Biletnikoff, Jameis Winston, Mario Edwards Jr. and Cameron Irving. Former basketball players include Sam Cassell and Dave Cowens. Baseball also receives good coverage with Buster Posey, Tyler Holt, Devon Travis and D.J. Stewart. Offering the primary hits in the product, Autographs and Relics are available for some of the football and baseball players. Signed cards are also found as parallels that are numbered to 99 or less. Looking back at winners of the Heisman Trophy and Golden Spikes Award, Honors inserts reflect on the more-decorated athletes. Parallels add more collecting choices across the base and insert sets with Silver, Gold and Black. 2015 Topps Rashad Greene Rookie Premiere Autograph 23 150 Jaguars Florida St.
2015 Panini Collegiate Draft Picks Auto Cameron Erving Florida St.